Speeches at a wedding reception can be challenging for DC wedding photographers to capture on film. We do not mean from a photographically technical point of view, of course. In that sense, photographing best men, maids of honor or fathers of the bride or groom speaking is the same as taking other pictures. A Washington, DC, wedding photographer needs to consider the same things as he or she does with any other shot. The lighting (whether ambient or from the photographer’s flash) must be right. The focal length of the lens selected must be appropriate for the story the picture is telling. The composition of the image must similarly give the bride and groom a sense of what happened at that moment. These same factors determine the quality of any photographs, be they wedding pictures or Washington, DC, engagement photos. The hard part in taking pictures of DC wedding speeches is finding the right moments to press the camera trigger. When photographing that part of a wedding reception, a Washington, DC, wedding photographer has a lot of subjects to consider. There is the person speaking — typically the maid of honor, best man or the father of the bride or groom. He or she is obviously “doing” the most in the scene. Washington, DC, wedding photographers who take pictures of them will get more dynamism and movement in their images. However, the bride and groom are also key figures. The speakers at a Washington wedding reception are usually talking to or about them. Their reactions to the words are important and often meaningful. The best Washington, DC, wedding photography is often images of brides and grooms laughing or crying during the speeches. Finally, a Washington, DC, wedding photographer must be aware of a third potential subject at a wedding reception: the crowd. Though the bridesmaid/groomsman/father is mainly addressing the newlyweds, the wedding guests are also part of the intended audience. Their reactions can make for great DC wedding photos by themselves. They can also strengthen shots of the bride and groom when the wedding guests’ emotions mirror the newlyweds’. The superlative shots of those moments during wedding receptions are no different than the best Washington, DC engagement photos. DC wedding photographers who excel at photographing speeches are those who can bring all the subjects into the frame. With artful composition, the best man (for example), newlyweds and wedding guests can all appear in the same image. The resulting photograph can then tell the whole story of what happened at that DC wedding reception. It can show the matron of honor, best man or father of the bride telling a touching/funny story about the newly-married couple. 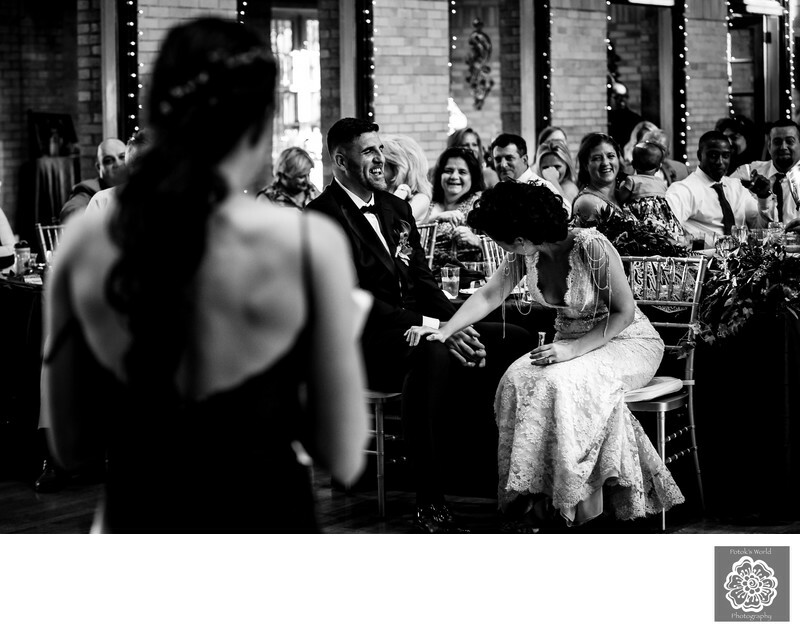 The picture can also communicate the DC bride’s and groom’s reactions to what their loved one is saying. Finally, inclusion of the Washington wedding audience in the photo gives a sense of the mood in the reception hall. When the bride and groom looks it in 20 years, they can relive the emotions they felt at those moments. As Washington, DC, wedding photographers, we believe that this image achieves that goal. The first thing that draws your eye is the groom’s face in the center of the frame. He is laughing, obviously reacting to something. Because the maid of honor is prominent in the foreground of the photo, the what becomes clear. Though you cannot see her face, you know that she is speaking at a DC wedding reception. You then notice the Washington area bride doubled over laughing at what the maid of honor is saying. Her reaction mirrors the groom’s, but her hand on his leg really communicates that they are connected in that moment. As your eye scans the rest of the image, you see the rest of the wedding guests sharing the mirth. We took this picture at St. Francis Hall, a great venue for wedding photography or Washington, DC, engagement photos. The DC wedding location gives brides and grooms access to the Franciscan Monastery of the Holy Land in America. The latter offers settings for couples portraits that any Washington, DC, engagement photographers would dream about. St. Francis Hall has a spacious and elegant ballroom with room for 250 wedding guests. It also facilitates getting great shots like the one featured here. Thanks to a stage at one end of the hall, a Washington, DC, wedding photographer can stand behind and above a speaker. That gives the photographer the possibility of capturing the three subjects mentioned above in the same shot. Location: St Francis Hall, 1340 Quincy St NE, Washington, DC 20017. Keywords: DC (18), engagement photos (3), Washington (18), wedding photographer (12), wedding photographers (3).